The overwhelming majority of the time when we complain about communication or seek a new and improved communication strategy, we mean that we’d like better ways to get others’ attention with what we have that we want them to know and internalize. A better word for that would be “marketing.” I need to get your attention because I need you to focus on and listen to me. Communication, though, is more than that. Fully half, and more if we’re wise, is stilling our thoughts and words in order better to listen. I discovered for the first time about fifteen years ago that the essence of spirituality can be boiled down to two words: paying attention. 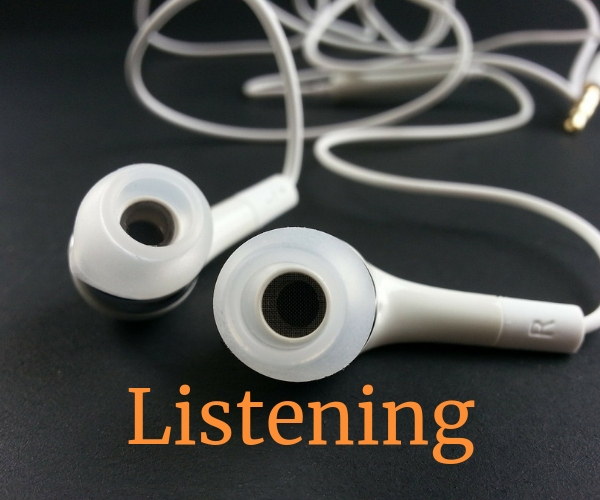 Being intentionally still and attentive to God speaking—that is, listening. If prayer is communication with God, then at the very least half of it isn’t about what and how I’m informing God of this or that but listening to what God wants to say, is saying, to me, to us. Great spiritual mothers and fathers through the ages have noted that the more mature they become in relationship with God and in prayer, the less and less they say, and the more they listen. During the past month our synod has begun an official communications audit, and we’re eager to follow through with this to learn how we might better communicate with each other as Lutherans in North Carolina and how we as a synod office can be more effective communicators for the sake of the whole church and the world. Naturally, then, a part of that must be listening. I love preaching in our congregations, but my favorite thing to do in congregations is spend time in conversation about the synod’s ministries, yes, but also in listening to what it is the congregation is about and what they need and how we can help. Our ongoing recruitment of Synod Storytellers is a two-way street. Sure, we want someone who can interpret in each congregation what the NC Synod is doing, but even more we want to be able to tell the stories of our congregations to each other. We want to listen to you, and we want to encourage you to listen to and learn from each other. As we move with Jesus closer and closer to Jerusalem during this Lenten journey, I pray that I might take the time, energy, and focus to listen to what God is up to and to what you and your congregation are up to and to how those two realities might line up. “This is my beloved Son, with whom I am well pleased. Listen to him!” Blessed communication to you, beginning with blessed listening.